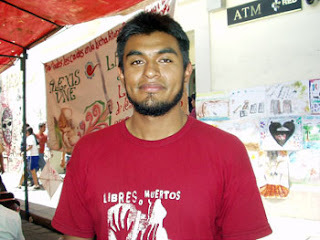 SENTENCING scheduled for DAVID VENEGAS REYES “ALEBRIJE”, ex political prisoner and prisoner of conscience of the Popular Assembly of the Peoples of Oaxaca (APPO) and of Oaxacan Voices Constructing Autonomy And Freedom (VOCAL). NATIONAL AND INTERNATIONAL SOLIDARITY URGENTLY REQUESTED IN DEMANDING JUSTICE FROM OAXACA AUTHORITIES. This coming April 6, 2009, after spending eleven months in prison and more than a year on parole with the obligation to report every two weeks, our comrade David Venegas Reyes will finally be sentenced in the last of two cases brought against him by the malevolent government of the killer Ulises Ruiz Ortiz in order to jail him and thereby keep him away from the APPO. On this date, he will be sentenced on the obviously trumped-up charge of possession with intent to sell cocaine and heroin, for which he was jailed on April 13, 2007. On April 13, 1007, at approximately 12:30 in the afternoon, David was walking through El Llano Park in the city of Oaxaca with two other people when he was violently apprehended with no arrest warrant by a commando of hooded armed men riding in a red van without plates or any kind of Police Department logo. He was thrown into the van at gunpoint by agents brandishing long arms. David was then ridden around the city with his own bag placed over his head to cover his face, beaten, and threatened with forced disappeared if he didn’t talk. This went on for several hours before he was taken to the Preventive Police Headquarters, known as “los Pinos” (The Pines), in Santa María Coyotepec, Oaxaca, a place where serious human rights violations, murders and disappearances of social activists have been committed by the Army as well as federal and state police forces. At “los Pinos”, the beatings and threats continued, and he was forcibly photographed and videoed with the drugs planted on him by the police. All of this was ordered by the ex Director of the Auxiliary, Banking, Industrial and Commercial Police (PABIC), Alejandro Barrita Ortiz, well-known for his repression of the social movement. David was finally taken to the Street Sales Drug Unit (UMAN) of the Federal Attorney General’s Office, along with the drugs planted on him at “los Pinos!”. After holding him there for two days, he was taken to the Santa María Ixcotel Prison in the City of Oaxaca, and as soon as he got there, was charged with Sedition, Conspiracy, and Arson for allegedly burning eight buildings in downtown Oaxaca on November 25, 2006. These included the State Supreme Court Building, which, as everyone knows, was burned by the killer Ulises Ruiz Ortiz’s own government to do away with evidence of the injustices committed by the judicial system and to incriminate a number of different APPO comrades. These acts of brutal repression against members of the popular movement committed by the federal police force under orders of Vicente Fox and the state police forces under orders of Ulises Ruiz Ortiz, on November 25, 2006, amounted to the worst case of mass human rights violations ever seen in Oaxaca, with almost 200 prisoners being transferred to a prison in the state of Nayarit, more than a thousand kilometers away from the land of Oaxaca. After winning two protective orders and two appeals, and having his charges “reclassified”, David was finally released on March 5, 2008, in absence of any proof whatsoever of his guilt, and totally exonerated of the offenses of arson for the buildings burned on November 25. Nevertheless, his case for possession with intent to sell cocaine and heroin has dragged on despite government misconduct including intentional delays, serious omissions, lies, and a series of contradictions in the testimony of the arresting officers, all of which should be sufficient for winning his absolute freedom. We further call on you to sign the following statement as backing for the petition for justice in this case. We continue to demand the exit of Ulises Ruiz Ortiz from the Oaxaca state government and will do so until the last day of his deadly regime. We will not rest in the struggle to achieve a deep, radical change in our society. At the same time, we extend our solidarity to the peoples throughout the world who are also struggling for a better world. ULISES RUIZ, MURDERER, OUT NOW! PUNISHMENT FOR ALL THOSE RESPONSIBLE FOR THE REPRESSION AGAINST THE PEOPLES OF OAXACA! Fax: 01 (951) 51566000. Ask for tone (¿Me da tono de fax, por favor? ).